The 17th Conference of the Parties (CoP) of CITES is finally over. Almost two weeks of complex discussions spoken in a code of numbers and acronyms that only experienced aficionados of the CITES process could decipher. Many journalists and NGO blogs have summed up the outcomes of the proposals, Decisions, Resolutions, etc. for elephants, rhinos, tigers, lions, pangolins, sharks and rays, sturgeons and paddlefish, tortoises and fresh water turtles, African Gray parrots – the list goes on. I have yet to find one that mentions great apes. Why do NGOs and animal lovers that become apoplectic when all elephants are not put on Appendix I – all commercial trade is already banned for them – say nothing when CITES decides to sweep reporting on illegal great ape trade under the carpet? And this is after the UN Great Apes Survival Partnership launched its Great Apes Seizure Database. 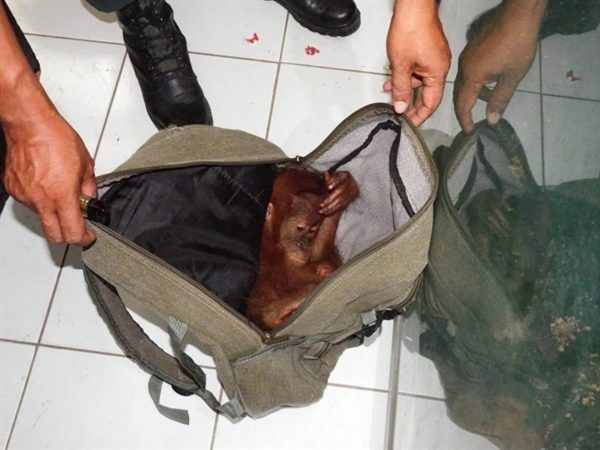 Over 1,800 great apes were seized from an illicit live traffic that went undetected for over a decade. If we assume 10 per cent of the specimens are seized (a high assumption rate from what PEGAS has observed), that means over 18,000 were trafficked from 2005 until earlier this year. Add onto that the fact that about 5 on average die for every one trafficked, that makes 90,000 apes! Only BBC wrote about the database launch and new findings, with a couple of news services repeating BBC. 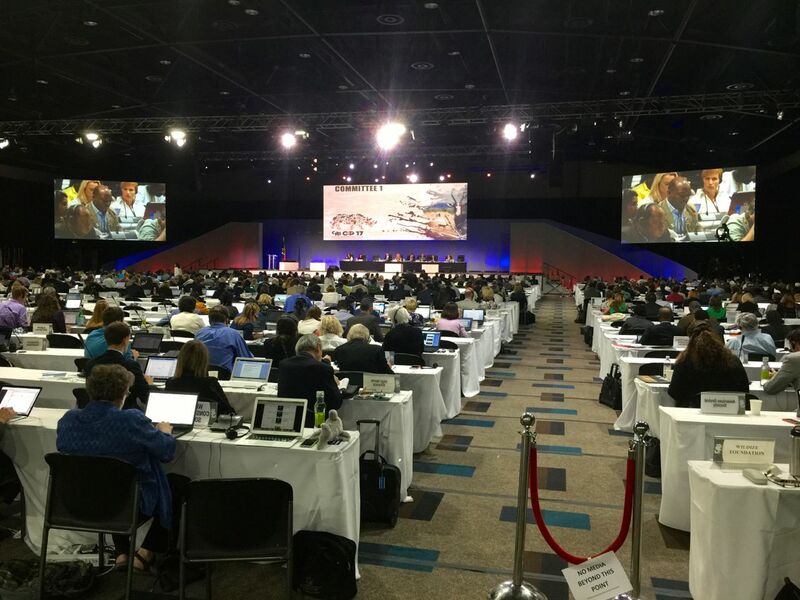 Hundreds, if not thousands, of articles were written about the elephant and rhino proposals, and the day the proposals came up for discussion the immense Sandton Conference Centre hall was packed, with TV and video cameras lined up to record the vote. It’s status quo ante for elephants and rhinos, but great apes are worse off, because there was a demand in Decision 16.67 that a way be found for illegal trade to be reported to CITES. With the verdict that only Parties will report seizures to CITES, taken as a result of the Secretariat’s recommendations contained in the Great Apes CoP 17 Doc. 61, CITES will still not have complete data before them at meetings and conferences. The new GRASP Apes Seizure Database will not be reported to CITES. In fact, the Secretariat recommended that GRASP not even establish its own database and reporting on illegal trade. There was a request made earlier on that GRASP work with the IUCN/SSC Primate Specialist Group to prepare a great apes status report, but it wasn’t ready for release at CoP 17. It is scheduled to be submitted now at the 69th Standing Committee meeting early next year. Will illegal great ape trade be reported in it? This entry was posted in CITES 17th Conference, PEGAS and tagged CITES, GRASP, illegal trade reporting. Bookmark the permalink. So why weren’t the great apes discussed? Was there no explanation from CITES? There was no explanation. No reply was given to questions that were asked. The committee chairwoman just closed the session after we made our interventions. It was lunch time, part of the problem of continuing discussion and many side events were starting up. But CITES has a record beginning in 2010 after Scanlon became the head of ignoring great ape issues. So what can we do to bring the plight of the great apes to the forefront of future discussions? The plight of great apes needs a higher profile in the public consciousness. This can be done through media exposure, in the same way that everyone knows about the plights of elephants, rhinos and tigers. I am always working with journalists, trying to get them to do stories on great ape trafficking. Ok thanks, good work. I would like to think that people like me who care about the great apes, could also contribute to the effort to save them. Is there a way for the general public to put pressure on CITES ? Write and tweet (@John_CITES) John Scanlon, head of CITES, saying you would like CITES to have independent reporting on illegal great ape trade – from all credible sources, not just governments.